It is incredibly difficult to review season two of Stranger Things without spoiling it. Even the most basic description of where the characters find themselves feel like it’ll ruin something you should find out for yourself. The plot unfurls slowly, since a lot of the point of the beginning of the season is how desperate everyone seems to be to put the events of a year ago behind them. And then, when the danger becomes all-consuming in the last third of the season, the pace picks up so that it’s almost too fast. The story isn’t as tightly plotted as it was last year, but it also makes up for it by following up a lot of threads from season one in great ways. In particular, I like how the arcs of Steve (Joe Keery), Nancy (Natalia Dyer), and Jonathan (Charlie Heaton) are all clear outgrowths of what they experienced. They’re not perfect, but they’re still good people. There is exactly one chunk of the season that isn’t as effective as it should be—a plot cul de sac right in the middle that doesn’t do much more than return a character to where they were earlier in the season, and is very clearly a set-up for the future more than it is vital to the story of this season. But as complaints go, it’s actually pretty minor. All the returning actors continue to be as good as you remember from last time, with Hopper (David Harbour) losing a lot of his bad qualities and Joyce (Winona Ryder) treading a line between trying to pretend everything’s fine and fierce over-protectiveness. 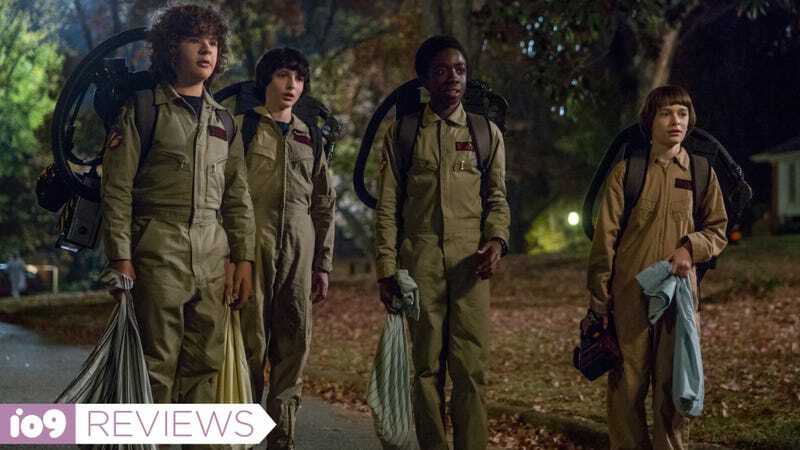 For Mike (Finn Wolfhard), Dustin (Gaten Matarazzo), and Lucas (Caleb McLaughlin), the plot is less important than the fact that they’ve reached the awkward age in between everyone at school dressing up and going trick-or-treating and everyone dressing up to go drink and party, and it’s causing a strain on their friendship. Wolfhard in particular does a great job with being resistant to change and being fiercely loyal. McLaughlin has to do a lot of explaining and pulls it off with aplomb. Matarazzo gets the most time to shine of any of the three, though. He has the most comedy to pull off and it’s scary how effortless he makes it look. His timing is perfect. Noah Schnapp also does a good job as Will, of course, but the character is still basically a plot point in this show—as the trailers and the last minutes of season one suggest, he didn’t come back from the Upside Down perfectly fine. Schnapp’s job is to switch from sweet and sensitive to unsettling, and he does it just fine. The new addition to this crew is Max (Sadie Sink), a character who is a pastiche of the new kid and tomboy that so often populated ‘80s stories. In particular, she feels very inspired by Bev from It, which could just be the result of It being in the zeitgeist again. That said, Stranger Things does more to actually look at what creates that kind of character—and her stereotypical “bad boy” stepbrother—that it’s partially a deconstruction. Whether or not you like how Max’s introduction affects the boys is going to vary a lot, but I can’t say it’s not a pitch-perfect ‘80s homage, and happily the show goes out of its way to make sure you don’t blame her for the breaks among the boys. As for Eleven (Millie Bobbie Brown), well, that’s even more impossible to discuss without spoilers. She is still great, still powerful, and plays a number of new relationships with utter sincerity that will break your heart. Two newcomers deserve particular praise: Sean Astin as Bob Newby and Paul Reiser’s Dr. Owens. Astin is so aggressively normal and nice it’s almost suspicious. (I’m also looking forward to eventual supercut of everyone saying/yelling “Bob” that will doubtlessly ensue.) Reiser has that sort of cheerful malice of a man who is both trying to help and trying to have everything his way. It makes it really hard to pin down his intentions, which is a nice bit of depth to a season where the main threat isn’t particularly complex. Stranger Things had an almost impossible task when it came to following up on a first season that had near-universal acclaim. That it’s still engaging, gorgeous looking, and smartly written is a truly impressive feat. The show didn’t hit any reset buttons; it let every character grow and change, and it’s just remarkable. This is a show growing naturally into itself and does everything to make the nine-hour commitment worth it.